This game is a bit of Americana, straight from the industrial heartland. 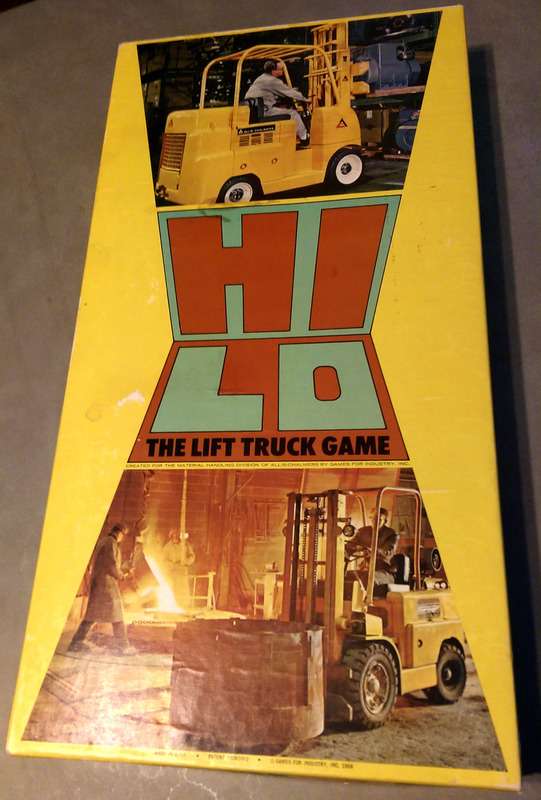 Hi-Lo: The Lift Truck Game was created specifically for the Material Handling Division of Allis-Chalmers, a company with Wisconsin roots—and West Allis, the city named after it. The game was designed and patented by Alan Charles, president of Games for Industry, Inc. of New York. As the company name implies, this firm created educational, promotional, and training games for organizations and businesses. Little is really known about Alan Charles and his company, which he formed in 1963. In fact, very few Games for Industry titles are known: Call Kelly, Citibank Worldwide Banking, Fun 'n' Sun Grace Line Cruise Game, and an educational Lawrence Welk "All Star" game for the American Cancer Society called Crusade. Alan Charles himself is likely best known for his TIME trivia game; but he made the most money off creating TV Guide's TV Game for Bob Reiss. I am obsessed with finding more information—and more games. Because even if they aren't always fun, I must find that out for myself, as I like to collect vintage games. Modern corporate games involve group exercises in trust and team building, and are usually held at camp-like retreats with lots of "high energy." But the games of yesteryear were more focused on the education, performance, and attitudes of individuals, not teams. As such, they were usually played under the supervision of a manager, with all the energy of being called into the principal's office. In Hi-Lo, the emphasis is on educating Allis-Chalmers employees regarding the proper use of forklifts, moving inventory safely, and (of course!) how it all affects the bottom line through inventory shrinkage. One sign of its vintage is that while I expected there to be some emphasis on workplace safety—say, penalties for using health insurance—there was not. Nor was there any mention of OSHA. The federal workplace safety regulator wasn't formed until 1971, so I guess that's fair. Per the game's instructions, the object of the game is as to see how much you, a lift truck driver, can save your firm by skillful, and efficient driving. Savings accumulate in the following ways: (1) Filling your side of the game board (the Driver's Panel) with cards corresponding to each of the seven categories, trading up cards for the highest dollars. (2) Correctly answering Hi-Lo Questions. (3) Collecting Bonus Cards and Good Driver Tokens. The player with the most dollars saved wins the game. Basically, you roll the dice and move about the board collecting cards, tokens, and answering multiple choice or true-false trivia questions about forklifts, their attachments, and loads. If this doesn't sound exciting, that's because it isn't. This game is educational. Plus, even if you sweat-out the trivia part and collect all the necessary cards and tokens in your Driver Panel, you still may not win. Because it's all about who has the most money at the end, even a player who hasn't filled their Driver's Panel can win. Ah, capitalism! Unless you are majorly into industrial manufacturing, forklift trucks or their accessories, this game is dull. And I'm not just saying that because I didn't win. Even those who played with me only enjoyed the game because they beat me at it. The game board is bright, as it should be. The artwork and photographs are appropriately industrial-looking. The colorful playing pieces are cool little barrels. (Being from Wisconsin, I'm pretty sure they are beer kegs.) And the game pieces are neatly stored in properly labeled, logo-covered boxes. And yet, fundamentally, this game really only holds joy for the Allis-Chalmers collector. Since it was made for the Material Handling Division of the company only, and because there are plenty of Allis-Chalmers collectors out there, this game is pretty darn scarce. Check eBay, check Etsy -- and, hey, there's currently a $100 version at Board Game Geek.